The Silver History Museum is a premiere educational virtual museum showcasing selections from more than 5,000 individual pieces of heirloom sterling silver we hold and curate in our secure facilities. We curate select pieces online for you to view in our custom-built, proprietary, annotated visual database. Above, Macaroni server, with pierced bowl and figural 3-D finial. We seek to advance knowledge of culture, technology and social traditions by engaging the public through beautiful sterling silver objects that tell intriguing stories of many histories: social history, the history of technology and smithing crafts; histories of dining cultures, economics and family traditions. Our focus is British, American and Russian sterling silver hollowware for the fine dining table. The collection’s time period begins with 18th Century George III pieces and extends to American 1920s Art Deco designs. As such, it is one of the largest, most selective, private sterling silver museum collections of fine dining objects in the U.S. It documents 250 years of dining traditions. Our classroom lessons are available online at no cost. We strive to help teachers vivify studies of art, human culture, social history, technology, food trends and fabrication technologies silver embodies. 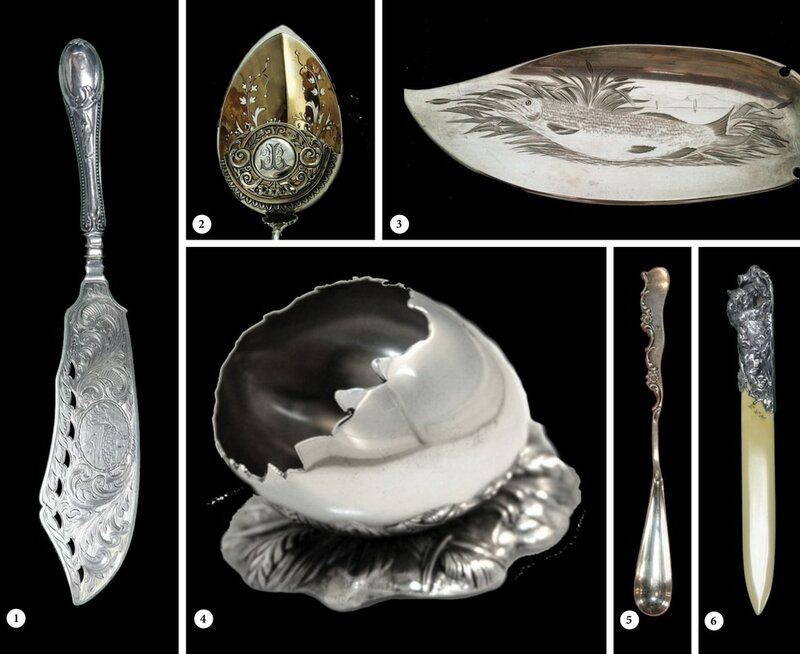 We are happy to host an online exhibit of your silver. 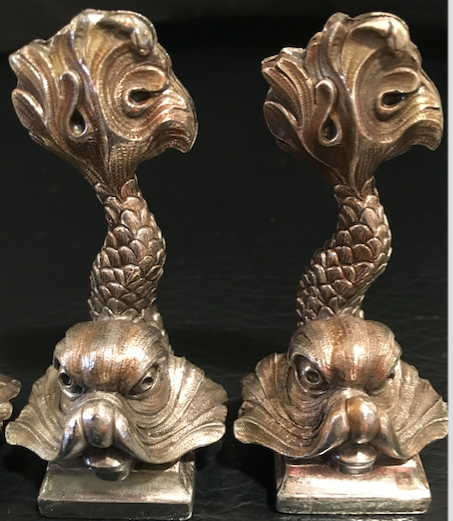 Two of a set of eight fanciful sterling place card holders.